Dedicate a day to cultivating wisdom, bliss and empowerment that will launch you into the year. In the morning we dive into a healing and empowering practice of fundamental and advanced Spinal Release Yoga that emphasize the experience of being STRONG + OPEN simultaneously. After lunch, we'll delve into ancient but practical teachings from the yoga tradition about the true nature of karma. We look to these relevant lessons about the sources of influence over our lives, and how to relate to the question of destiny versus free will. We will end with a second deep yoga practice to take the physical and mental openings of the day to the next level. I was inspired to teach this subject the day after the presidential election - it is time to unpack this profound teaching from the Bhagavad Gita about the full spectrum of karma. 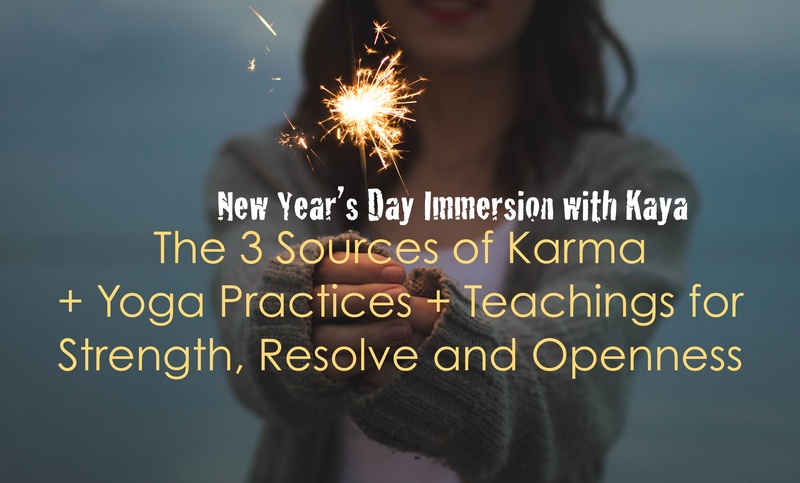 Through yoga practice + wisdom we cultivate an understanding and relationship with these three influences over our lives and learn how to cultivate peace and freedom from obstruction at all levels. Register Now, to save your spot!